Weather has been particularly good so far this month, but that is about to change starting tomorrow. Temps have been above average, but when I look at the forecast I see trouble. Big drop in temps over the next week and more typical fall like weather. Pumpkin growth will be slow in the best case scenario and in the worst case scenario we will have frost. One forecast shows five days at 32 degrees or a couple of degrees below in the next week. The other forecast shows three days in the 33-35 degree range, but nothing at 32 degrees or below. For the plants, there is a big difference between 34 degrees and 32 degrees because frost comes into play. Pumpkin leaves don't like even a little bit of frost. They are pretty sensitive. My temperature sensor says between 6:50 and 7:05 is the lowest temperature of the day on average. So I'll be watering both patches just before that time because the water is warmer than the air. 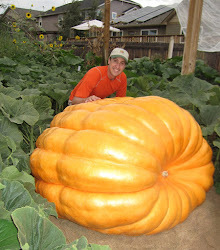 A fair amount of rain in the forecast, but I'm not too worried about splitting the pumpkins from too much water because growth is very slow and would rather keep the leaves from freezing since the 1685 Scherber plant still has another 3 weeks until the weigh-off. Even if we do get frost, the pumpkin will probably continue to grow, because the roots and vines will be fine, but the leaves will be dead. Today I sprayed kelp, B-vitamins, humic acid and silica on the leaves to help protect the plants from frost.